David is a person who picks up on what you're putting out and mirrors it. On this day, my energy is like a fur coat―dramatic, silly, and slightly obnoxious―he puts it on and we shimmy and laugh and wander around the city killing time. This feels better than anything I've done intentionally lately―I am light and springy. Chicago in January is a marvel―grey and sharp, bitter and uniting. I feel seen beneath my meat carcass and I wonder if he'll try to kiss me, but I don't think he will. We're going to see the Chicago Symphony Orchestra. I've never been before. Sometimes I'm embarrassed about how little I know about music. I like it, I enjoy it, I like the way it makes me feel, but I don't collect facts. I don't retain names. I'm not knowledgeable. I played the clarinet for a while and made a solid attempt at guitar, but it's really not my medium. I'm a listener. I like listening. I don't like making noise. We climb the stairs, up to the lower balcony. I like it up here; it makes me feel small and large at the same time. The CSO is golden yellow, accented by red carpets and the whole thing seems to shimmer. As the orchestra tunes, I show David how my Alexander Technique instructor taught me to sit in a chair. Sit near the edge. Elongate the spine, imagining a string pulling upward from the crown of your head. Relax your arms and place your hands, palms down, gently on your thighs. Relax your jaw so that your tongue is loose. Sitting this way focuses your mind. It's powerful. In the stillness, in the safety of the lower balcony, my mind starts to relax, to relinquish control. I breathe in and out. The variation between the temperature of my legs and my hands dissipates until I'm not sure where one begins and the other ends. My nose adjusts to the stale air and the rose perfume of the woman in front of me. I am present. They begin playing and my eyes focus on the glimmer of the moving parts below. There's a young man in the percussion section. He gets up walks down to the triangle―rings, rings, rings― then goes back and sits down. That's his job. That's his role. He almost falls out of his chair. I wonder if he's embarrassed. I wonder how much time he's put into all of this. How much time did it take to get to the point where he's good enough to sit there, to play here for me, and the hundreds of others here? I think about how long it's taken for all of them―the hundreds of thousands of collective hours that have been put in to make this moment. There's a violinist with a large ring on her finger and I wonder what it must have been like when she first got engaged. How proud she must have been of that ring and how odd must it have felt to position her fingers with this new weight settled upon them. They look like the miniatures that I love at the Art Institute. 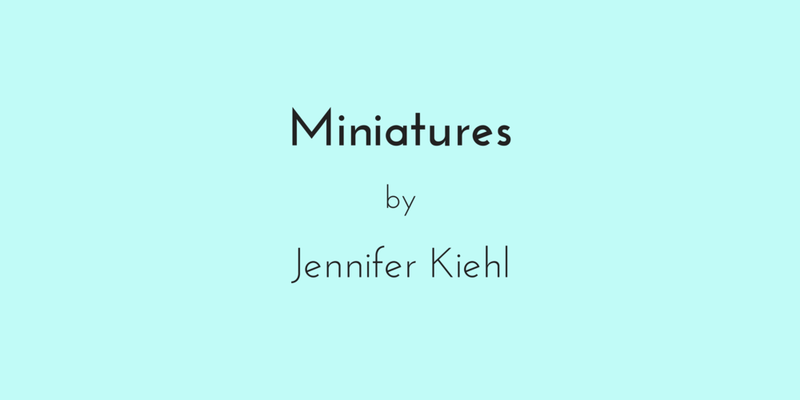 The miniatures are my favorite. I remember when I learned to sit this way―how excited I was, how hard I practiced―I was eighteen and living in London. I think about the day I wandered the city, the day I wandered into a dingy pub engulfed in yellow―both in light and smell. I drank a cider and read. A disheveled man with brown eyes and peppery scruff smiled at me. He smelled like sweat and mold―the kind of mold that is permanently weaved into the fabric of the clothes from being washed without properly drying. He tries to start a conversation and I politely shut it down and focus on reading my book. A while later, I'm still reading and he's sitting a table over and he begins coughing. At first I ignore it, but then it gets louder and violent and I look over and notice blood dripping onto his dingy, once white undershirt. I get up and he says, "It's fine." He says, "I'll walk to the hospital." He says, "It's only a few streets away." He coughs and a splattering of blood lands on my black and white striped shirt. I walk with him. I walk and he keeps coughing and I hand him a microfiber eye glass cloth from my bag for him to wipe his face on and I feel bad that I was dismissive of him. He looks like my dad. When we get there he's rushed inside and I go to the bathroom to wash my hands. The soaps turns a light shade of lavender as it mixes with the blood. I place my hands under the dryer, shiver at the warmth, and watch as my loose skin moves about. I go to the waiting area. I sit and wait in a leather chair that reminds me of an airport. I wait and I practice sitting up straight, supporting my spine, placing my hands gently on my thighs, relaxing my jaw. I sit and I wait. It's not long, maybe an hour, before a doctor comes out and tells me he died. She says "I'm so sorry for your loss." She asks, "What's his name?" I think he told me his name, but I can't remember it. I tell her that I don't know. I tell her that I just met him. I tell her that I'm sorry. I get up. I exit through the automatic doors. The air is muggy and hard to breathe. I look around and try to figure out how I got here. I walk home to my tiny shoebox of an apartment. I take off my shirt and go down the hall to our communal kitchen to try to rub the blood out of the white stripes. I go back to my room and hang the shirt to dry on my door handle and lay down. I think about the time he put in to make this moment. I wonder what he looked like as a child. I wonder what his parents were like. I wonder if he's ever been loved. I wonder when he began to slouch. I think about all the hours he spent trying, only to end up speckled with grey and alone. I try to remember his name and I can't. It doesn't feel beautiful at all.